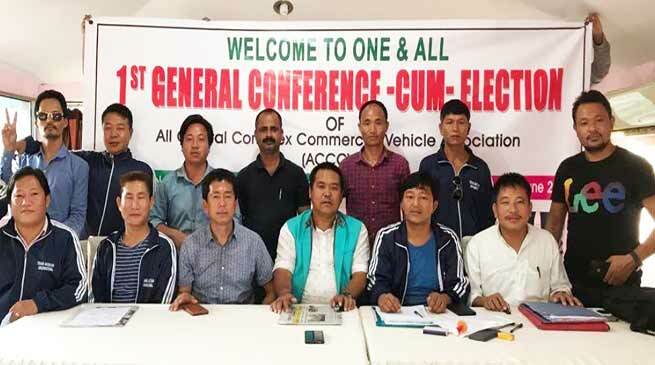 The All Capital Complex Commercial Vehicle Association (ACCCVA) organise its 1st general conference and traffic awareness here at Hotel Barapani on Sunday. Addressing the function All Arunachal Pradesh Public Transport Federation (AAPPTF) former Godak Bida said that the rules and regulation of traffic need to be maintained by all including the commercial vehicle owners as well as drivers in any case to avoid any types of accidents while driving. Rivers as well as owners should maintain more alertness so that they could not increase the traffic congesant and allow the other commuters to drive freely. He cautioned the use of alcohol while driving the any vehicle and avoid tobacco and other drugs to maintain goo health and sound mind. Former General Secretary AAPPTF Toko Tadap while emphasis on road safety and health and hygiene in the stand and parking area. He said that accidents are accidents and we also should discard on taking/imposing fine and try to become a good citizens. He appeal all to support the administration in maintaining traffic management. Among other Organising Chairman KIpa Kanam, Vice Chairman Dayum Tacho also spoke on the occasion and suggested various traffic rules and regulations. Later the conference witness the election/selection process of the new committee and a new committee headed by Tarh Kaha selected as new President of ACCCVA with 21 other executive members for the session 2018-21. Members of 17 federal units of the ACCCVA were present on the occasion.